Flanders (Dutch: Vlaanderen [ˈvlaːndərə(n)], French: Flandre [flɑ̃dʁ], German: Flandern) is the Dutch-speaking northern portion of Belgium, although there are several overlapping definitions, including ones related to culture, language, politics and history. It is one of the communities, regions and language areas of Belgium. The demonym associated with Flanders is Fleming, while the corresponding adjective is Flemish. The official capital of Flanders is Brussels, although Brussels itself has an independent regional government, and the government of Flanders only oversees some cultural aspects of Brussels life. 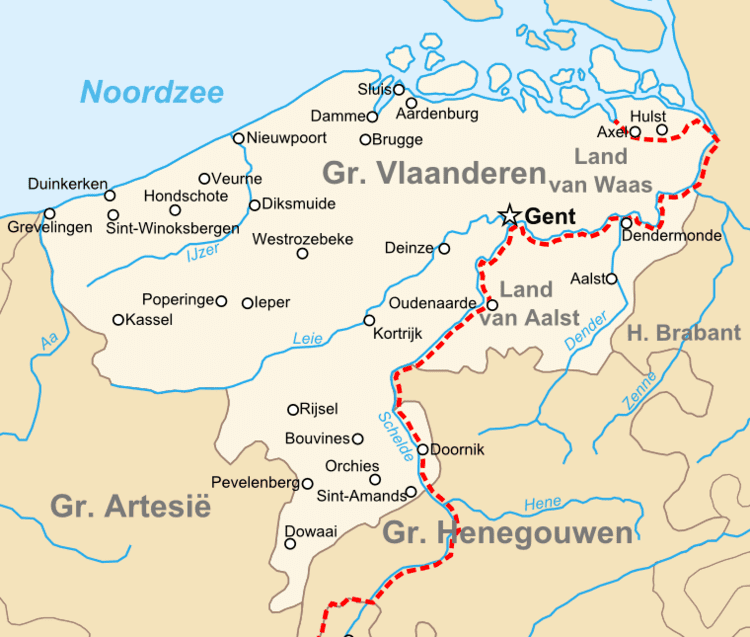 In historical contexts, Flanders originally refers to the County of Flanders (Flandria), which around AD 1000 stretched from the Strait of Dover to the Scheldt estuary. The core of historical Flanders is situated within modern-day Flanders and corresponds to the provinces West Flanders and East Flanders, but it sometimes stretched into what is now France and the Netherlands. Nevertheless, during the 19th and 20th centuries it became increasingly commonplace in English and some other languages to use the term "Flanders" to refer to the entire Dutch-speaking part of Belgium, stretching all the way to the River Maas, as well as cultural movements such as Flemish art. In accordance with late 20th century Belgian state reforms the area was made into two political entities: the "Flemish Community" (Dutch: Vlaamse Gemeenschap) and the "Flemish Region" (Dutch: Vlaams Gewest). These entities were merged, although geographically the Flemish Community, which has a broader cultural mandate, covers Brussels, whereas the Flemish Region does not. Flanders has figured prominently in European history. During the late Middle Ages, cities such as Ghent, Bruges, Antwerp and Brussels made it one of the richest and most urbanized parts of Europe, weaving the wool of neighbouring lands into cloth for both domestic use and export. As a consequence, a very sophisticated culture developed, with impressive achievements in the arts and architecture, rivaling those of northern Italy. Belgium was one of the centres of the 19th century industrial revolution but Flanders was at first overtaken by French-speaking Wallonia. In the second half of the 20th century, however, Flanders' economy modernised rapidly, and today Flanders is significantly more wealthy than its southern counterpart and in general one of the most wealthy regions in Europe and the world. Geographically, Flanders is generally flat, and has a small section of coast on the North Sea. Much of Flanders is agriculturally fertile and densely populated, with a population density of almost 500 people per square kilometer (1,200 per square mile). It touches France to the west near the coast, and borders the Netherlands to the north and east, and Wallonia to the south. The Brussels Capital Region is an enclave within the Flemish Region. Flanders has exclaves of its own: Voeren in the east is between Wallonia and the Netherlands and Baarle-Hertog in the north consists of 22 exclaves surrounded by the Netherlands. One of the regions conquered by the French in Flanders, namely French Flanders in the Nord department. French Flanders can be divided into two smaller regions: Walloon Flanders and Maritime Flanders (Westhoek). The first region was predominantly French-speaking already in the 1600s, the latter became so in the 20th century. The city of Lille identifies itself as "Flemish", and this is reflected, for instance, in the name of its local railway station TGV Lille Flandres. Within this Dutch-speaking part of Belgium, French has never ceased to be spoken by some citizens and Jewish groups have been speaking Yiddish in Antwerp for centuries. Today, Flanders' minority residents include 170 nationalities — the largest groups speaking French, English, Berber, Turkish, Arabic, Spanish, Italian and Polish. The area, roughly encompassing the later geographical meanings of Flanders, was considered to be in the northern and less economically developed part of Gallia Belgica. Under the Roman empire this became an administrative province, but much of modern Belgium eventually became part of Germania Inferior. These were the most northerly continental provinces of the Roman empire. Linguistically, the tribes in this area were under Celtic influence in the south, and Germanic influence in the east, but there is disagreement about what language was spoken locally, which may even have been an intermediate "Nordwestblock" language related to both. By the first century BC Germanic languages had become prevalent. In the future county of Flanders, the main Belgic tribe in Roman times was the Menapii, but also on the coast were the Marsacii and Morini. In the central part of modern Belgium were the Nervii and in the east were the Tungri. The Tungri especially were thought to have links to Germanic tribes east of the Rhine. Another notable group were the Toxandrians who appear to have lived in the Kempen region, in the northern parts of both the Nervian and Tungrian provinces. The Roman provinces of the Menapii, Nervii and Tungri therefore correspond roughly with the medieval counties of Flanders, Brabant and Loon, and the modern Flemish provinces of East and West Flanders (Menapii), Brabant and Antwerp (Nervii), and Belgian Limburg (Tungri). The County of Flanders started to take control of the neighbouring County of Brabant during the life of Louis II, Count of Flanders (1330-1384), who fought his sister-in-law Joanna, Duchess of Brabant for control of it. The titles were eventually more clearly united under Philip the Good (1396 – 1467), Duke of Burgundy. The County of Loon, approximately the modern Flemish province of Limburg, remained independent under the lordship of the Archbishop of Liège until the French Revolution, but surrounded by the Burgundians. The French-speaking bourgeoisie showed very little respect for the Dutch-speaking part of the population. French became the only official language in Belgium and all secondary and higher education in the Dutch language was abolished. In 1834, all people even remotely suspected of being "Flemish minded" or calling for the reunification of the Netherlands were prosecuted and their houses looted and burnt. Flanders, until then a very prosperous European region, was not considered worthwhile for investment and scholarship. A study in 1918 demonstrated that in the first 88 years of its existence, 80% of the Belgian GNP was invested in Wallonia. This led to a widespread poverty in Flanders, forcing roughly 300.000 Flemish to emigrate to Wallonia to start working there in the heavy industry. During the interbellum and World War II, several right-wing fascist and/or national-socialistic parties emerged in Belgium, the Flemish ones being energized by the anti-Flemish discrimination of the Wallonians. Since these parties were promised more rights for the Flemings by the German government during World War II, many of them collaborated with the Nazi regime. After the war, collaborators (or people who were Zwart, "Black" during the war) were prosecuted and punished, among them many Flemish Nationalists whose main political goal had been the emancipation of Flanders. As a result, up until this day Flemish Nationalism is often associated with right-wing and sometimes fascist ideologies. These victories for the advocates of much more Flemish autonomy are very much in parallel with opinion polls that show a structural increase in . Since 2006, certain polls have started showing Flemish independence. Those polls are not yet representative, but they point to a significant long-term trend. For some inhabitants, Flanders is more than just a geographical area or the federal institutions (Flemish Community and Region). Supporters of the Flemish Movement even call it a nation and pursue Flemish independence, but most people (approximately 75%) living in Flanders say they are proud to be Belgian and opposed to the dissolution of Belgium. 20% is even very proud, while some 25% are not proud and 8% is very not proud. Mostly students claim to be proud of their nationality, with 90% of them staying so. Of the people older than 55, 31% claim to be proud of being a Belgian. Particular opposition to secession comes from women, people employed in services, the highest social classes and people from big families. Strongest of all opposing the notion are housekeepers - both housewives and house husbands. Flanders has developed an extensive transportation infrastructure of ports, canals, railways and highways. The Port of Antwerp is the second-largest in Europe, after Rotterdam. Other ports are Bruges-Zeebrugge, Ghent and Ostend, of which Bruges and Ostend are located at the Belgian coast. Mirroring the historical political conflicts between the freethought and Catholic segments of the population, the Flemish educational system is split into a secular branch controlled by the communities, the provinces, or the municipalities, and a subsidised religious—mostly Catholic—branch. For the subsidised schools, the main costs such as the teacher's wages and building maintenance completely borne by the Flemish government. Subsidised schools are also free to determine their own teaching and examination methods, but in exchange, they must be able to prove that certain minimal terms are achieved by keeping records of the given lessons and exams. It should however be noted that—at least for the Catholic schools—the religious authorities have very limited power over these schools, neither do the schools have a lot of power on their own. Instead, the Catholic schools are a member of the Catholic umbrella organisation VSKO. The VSKO determines most practicalities for schools, like the advised schedules per study field. However, there's freedom of education in Flanders, which doesn't only mean that every pupil can choose his/her preferred school, but also that every organisation can found a school, and even be subsidised when abiding the different rules. This resulted also in some smaller school systems follow 'methodical pedagogies' (e.g. Steiner, Montessori, or Freinet) or serve the Jewish and Protestant minorities. The biggest difference between Belgian Dutch and Dutch used in the Netherlands is in the pronunciation of words. The Dutch spoken in the north of the Netherlands is typically described as being "sharper", while Belgian Dutch is "softer". In Belgian Dutch, there are also less vowels pronounced as diphthongs. When it comes to spelling, Belgian Dutch language purists historically avoided writing words using a French spelling, or search for specific translations of words derived from French. While the Dutch prefer to stick with French spelling, as it differentiates Dutch more from the neighbouring German. For example, the Dutch word "punaise" (English: Drawing pin) is derived directly from the French language. Belgian Dutch language purists have lobbied to accept the word "duimspijker" (literally: thumb spike) as official Dutch, though the Dutch Language Union never accepted it as standard Dutch. Other proposals by purists were sometimes accepted, and sometimes reverted again in later spelling revisions. As language purists were quite often professionally involved in language (f.e. as a teacher), these unofficial purist translations are found more often in Belgian Dutch texts.